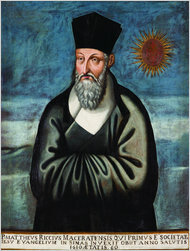 Matteo Ricci: "The Master from the West"
The editors of The New York Times evince something of a fascination for Matteo Ricci, the great Jesuit missionary to China. As well they should! The Italian Jesuit (1552-1610) was fascinating man living in a fascinating era who did fascinating things. A few months ago, the Times ran this piece about a grand world map that Ricci created in the early 1600s. Today the online edition of the Times features this thoughtful piece on the Renaissance man (in both senses) and, more specifically, on "The Master from the West," an exhibit that commemorates the 400th anniversary of the Jesuit's death, which has visited Beijing, Shanghai and Nanjing and Macao. And, by the way, the piece has a great lede. In early May of 1610, the renowned Italian missionary Matteo Ricci took to his bed in the small Beijing rectory he shared with his fellow Jesuits. It was the Confucian exam season, when candidates from around China flocked to the capital to be tested, and Ricci had been besieged by visitors — sometimes 100 a day. The men who knocked unbidden were drawn by his knowledge of astronomy, mathematics, mechanics, philosophy, literature and rhetoric; the widely popular books he had written — in Chinese — including “On Friendship” and “Ten Discourses of a Strange Man”; his Chinese translation of Euclid’s “Geometry”; annotated maps of the world; deep knowledge of the Confucian classics; phenomenally trained memory — he could scan a list of 500 Chinese characters once and then recite it from memory — backwards — and, no doubt, his reputation for sincerity and modesty. Ricci met them all — and reciprocated each visit within four days, as etiquette demanded. But his exhaustion was so extreme that he knew the end was near. As the sun set behind the Forbidden City on the evening of May 11, Ricci breathed his last. “The Master From the West: An Exhibition Commemorating the 400th Anniversary of the Passing of Matteo Ricci” marks the Jesuit’s death by celebrating his remarkable life. Initiated by the Marche region of Italy, where Ricci was born in the hillside town of Macerata in 1552, the exhibition has been held in Beijing, Shanghai and Nanjing. It opened at the Macao Museum of Art on Aug. 7 — the day Ricci first landed there, then a Portuguese colony, 428 years ago — and runs through Oct. 31. The painting depicts a gray-bearded Ricci dressed in a tall hat and flowing robe with his arms hidden in the sleeves.